Today is a sad sad day for me... it is my last day as a guest designer here at Jaded Blossom. I have thoroughly enjoyed making projects and expanding my creative mind during this month. I cannot thank the Jaded Blossom ladies enough for all of the encouragement and challenges they have given me this month. I have reached out of my rectangle card making box and learned about some very cool tips and tricks by playing more with favors. I am looking forward to all of they stamps they come out with in the future. Ok, enough sappy stuff, here's my project. With all of the relay for life events happening around me lately, I can't help but think about all those effected by all the different kinds of cancer in the world. I came across these pink swirled candy sticks and knew I was going to make something for relay. I used the Awareness Ribbon die from Jaded Blossom and punched out the base with white cardstock and the insert using a pink country plaid. I like Jaded Blossom dies so much because of the stitching that is punched out on the image. I colored over the stitching with pink glitter pen. 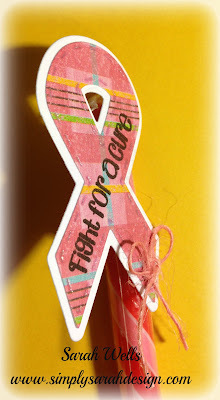 I used the sentiment from Fight for a Cure and stamped it across the ribbon with my versafine black onyx ink. 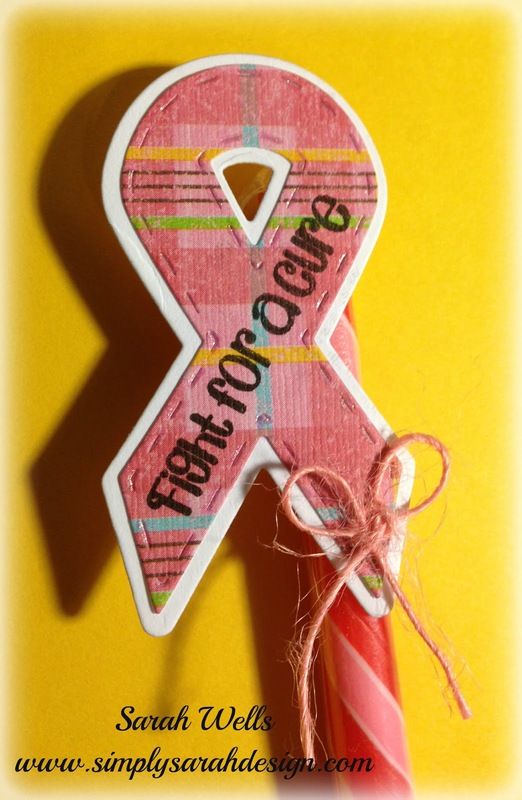 I topped off the design using light pink jute and making a ribbon. I hope you like my final project, it's a simple one but I know it has a great impact on those fighting and surviving any and all cancers. Thanks again Jaded Blossom ladies... you are fantastic and I cannot wait to see what awesomeness you come up with next! Thank you so much Sarah for being our Guest Designer this Month! Your creations have been Amazing and we truly appreciate all the work that you have done.